Mary Jane is great at making herself the life of the party at every function, and this Super bowl season is no exception! Of course you could have a pretty cool Super bowl turn- up without trees, but why on earth would you? 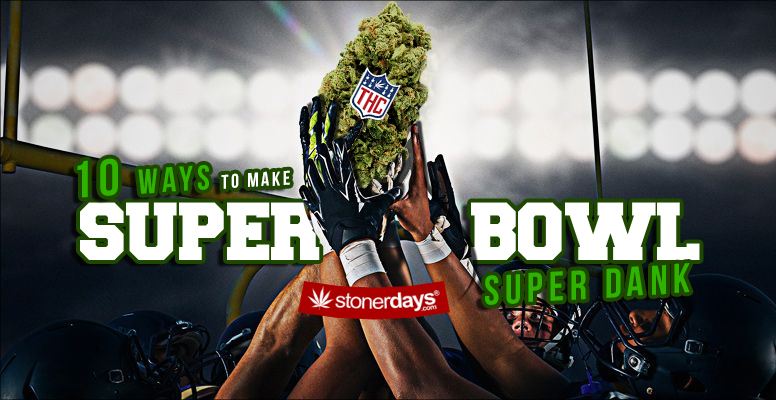 Keep your low eyes scrolling for 10 ways to make your Superbowl dank this year. All your game time favorites like nachos, wings, and even guacamole can be turned into edibles. Check out our stoner cookbook for a closer look on how to execute these munchies perfectly to give you the munchies. Delicious flavors will have you and your guests wishing everyday was game day. There’s nothing like the feeling of lighting a blunt the moment you need one. When the pig skin begins to fly you’ll never know when the need might occur. You’ll be able to focus completely on the game or entertaining close ones and not miss a second due to grinding, rolling, or breaking down. You might even want to stash a few killer pre-rolls especially for half-time. 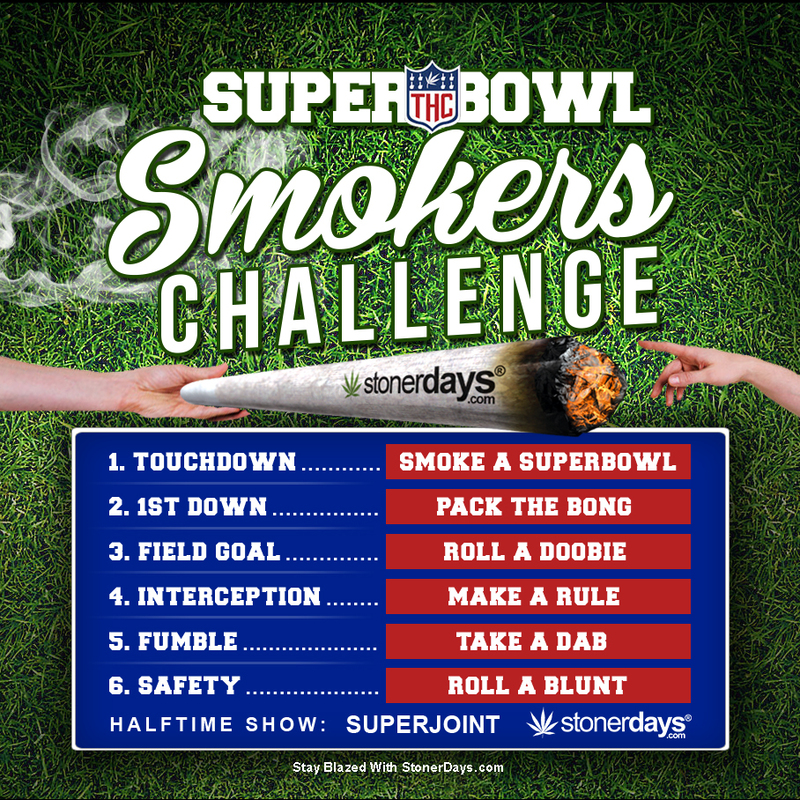 Put a twist on words and the way you get high by dedicating yourself to only smoke “super bowls” on this great day and bring out the ol’ bong collection. It shows just how serious you are about your love of football and flying to the moon. For allot of people and stoners alike, the best part of the Super bowl is the halftime show. Naturally we planned to be comfortably numb through it all, seeing the lights and cheerleaders as if for the first time. Now is the time for extendos and oil rigs to take center stage along with the artists and steal the show. You knew the bowl commercials were going to be cool, but you didn’t think you’d have sore ribs and cheeks from gut busting laughter and full teeth cheesing… thank the Sativa for that. This is an option great for family Super bowl events where a younger audience is in attendance. Show off your high creative prowess by building cool goal posts. Legos, or even gluing tiny footballs together in the shape of little goal posts. Flicking little paper footballs through the air and watching as they soar just as your mind has can be very satisfying. THC juices and punches will really set the party ablaze. Have the party more soothed than actually “boozed” but still quenching your thirst. Music and sports are a match made in heaven and since this Super bowl is a dank one, it needs to come with a killer playlist. Songs to keep up that game spirit and songs to smoke Mary Jane to of course. Feeling good vibes and smoking even better ones is what this day is all about. Weed themed bets are always the best. 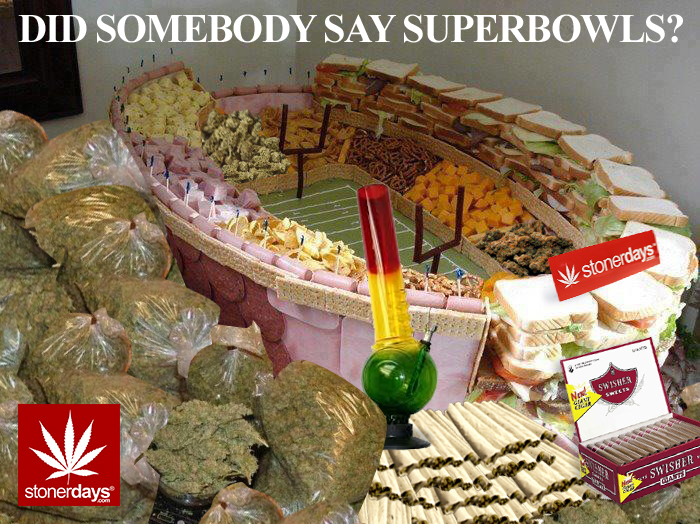 If you’re feeling extra confident in your team this Super bowl season why not see what the bud gods have in store? If your team looses you supply the munchies for a week, vice/versa you supply the roll ups of the winners choice for a week, you know mix it up however you’re feeling. Latest statistics have shown that nearly 89% of NFL players uses our beloved Mary Jane…. Just knowing that the player whose jersey you’re sporting could have gotten blazed before the game; wow! Sometimes it’s just the thought that counts. We hope these help all you stoners have the Dankest Superbowl you’ve had to date. Keep playing and keep smoking guys! This entry was posted in Featured, Stoner Guide, Stoner Top 10's. Bookmark the permalink.